Josh Reeves, a former National Star student, is changing attitudes to disability in Antigua by recruiting ambassadors on Skype from the comfort of his bedroom in Cardiff. 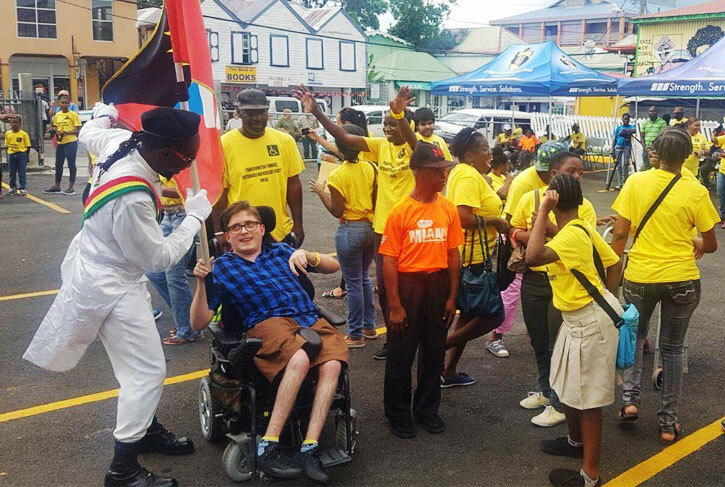 Josh, 20, who has cerebral palsy, will teach non-disabled children in Antiguan schools about disability following a visit to the Caribbean island for a three-day Commonwealth conference entitled I Am Able. And he has the backing of The Antiguan High Commissioner, Her Excellency Karen-Mae Hill, who extended the invitation after visiting Josh’s former college, National Star. Josh, who is from Beddau near Pontypridd and studying media at Cardiff & Vale College, found at one school the children had to get a plank of wood to enable him to get his powerchair up the steps. In his hotel the manager had to physically knock down a step to enable Josh to get his chair into the shower. Josh’s New Year resolution is to step up his own long-running Don’t Call Me Special campaign, getting his message out at home and abroad. He plans to target schools in the UK and other Commonwealth countries and places where he has friends, including Africa, Australia and India. He’s also harnessing social media, being active on a Commonwealth WhatsApp group and planning to make a YouTube documentary about his trip in Antigua. ‘I want my campaign to be on top form next year. It’s my dream job, I love changing people’s perspectives. I feel that I’ve been put on this earth to do this. The I Am Able conference was a collaborative initiative which saw people from across the world discussing access to education, employment, political participation and health. The aim was to create a roadmap for promoting, protecting and monitoring the rights of people with disabilities, particularly young people. The event saw Josh starting to change the way people speak and think as he led the youth forum, having been invited by his former teacher David Finch, Director of Technology Information at National Star. ‘The lawyers and doctors at the conference used the word “handicapped” and I told them they shouldn’t. I think everyone learned that I don’t like the word “special” either and we don’t have “carers”, we have PAs or facilitators. It’s not the people, it’s society – I’m going to make sure people learn there’s a better way. ‘I am living with cerebral palsy. I was isolated growing up, with people giving me sympathy and patronising me and a lot of discrimination. I don’t want other people with disabilities to feel labelled and that they’re not classed as humans – I don’t want that to happen anymore.